Release 2.11 - Maps and more! Beside our infrastructure switch from http to https for more privacy and security, here's another release with some new features. Feature: Search for folders additionally to files only. 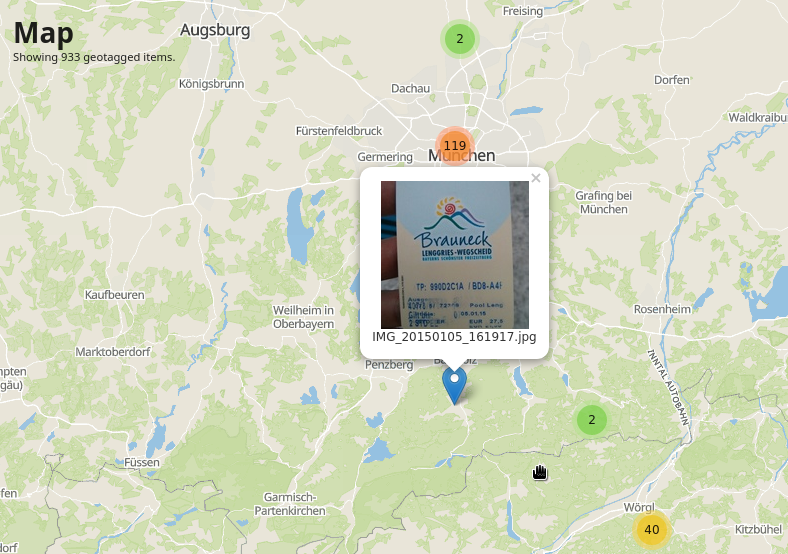 Feature: Map component showing locations of a single image or all images of a complete folder hierarchy, as long as they have gps coordinates. Thanks to the great Leaflet, Leaflet-ClusterMarker and OpenStreetMaps projects for making this possible. Change: Updated bundled ImageMagick 7.0.7.28 in windows packages with combined magick tool for smaller size. Change: We SSLed our infrastructure (website, repo, etc. -> https only) for more privacy powered by LetsEncrypt. That's why update/news checks fail on previous versions since this endpoint changed too. Fix: ACME(LetsEncrpyt) error on registration check. Fix: Saving playlist with previous deleted files simply skipping it instead of throwing bad errors. Feature: Improved speed of image analysis, so even with EXIF (orientation, gps, date) data reading we're now faster than before without it. Feature: Using EXIF-orientation-flag to create correctly rotate images and thumbnails. Feature: Server name configurable via configuration file in case you run multiple instances in one network. Feature: Clipboard: Show and preserve copy/move errors per file instead of toast-message only. Feature: UPnP/DLNA basic search capability. UPnP spec is totally overengineered and we tried hard to find clients supporting search at all, so we implemented a basic set that works fine for our favorite android client MediaHouse. Feedback is welcome here! Change: Because of improved image scan speed, we changed default setting of Read EXIF option from false to true. Fix: Video seekbar positioning on transcoding playback. Feature: FileSync now checks last modification date of files to detect changes instead of only adding new files and removing those not existing on disk anymore. Feature: View settings for file browser, notes, bookmarks and editor are now stored in user profile instead of browser storage. Feature: Download complete folders zipped (including all files and subfolders within). Feature: Permanently save preferred encoding of text editor via settings dialog. Feature: Added action to jump to a files folder from search view. Change: Redesign of internal async-mechanism for more performance, security and control of background jobs. Change: Lots of internal improvements, integration testing and java/android client restructuring. Fix: Action pop-up in file edit dialog. Fix: Database timeout problem when encoding of a large video file takes very long. Release 2.7 - Ready for the future! Once again it took us some time to bundle this new release, but once again it's totally worth it! Lots of things changed in our environment: On one side there's the new Java 9 release we're now compatible with as well as some major updates of the core libraries we depend on like Spring 5, Ffmpeg and ImageMagick. On the other side we automated some more parts of our development infrastructure to reduce release overhead and to be able to publish more frequently. Feature: Basic Java 9 support. Feature: UI redesign based on material design style with better responsiveness. 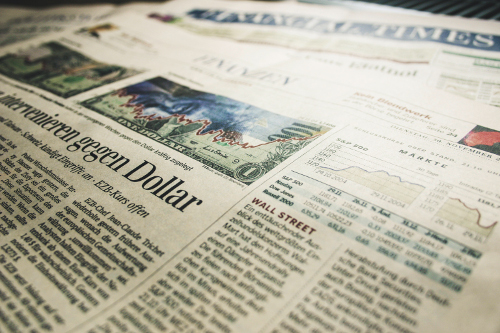 Feature: Optimized resource loading and caching, especially when it comes to updates. Feature: Embedded text file editor with syntax highlighting to view/edit your files on-the-fly. Feature: MP4 live transcoding for better playback in IE and Safari. 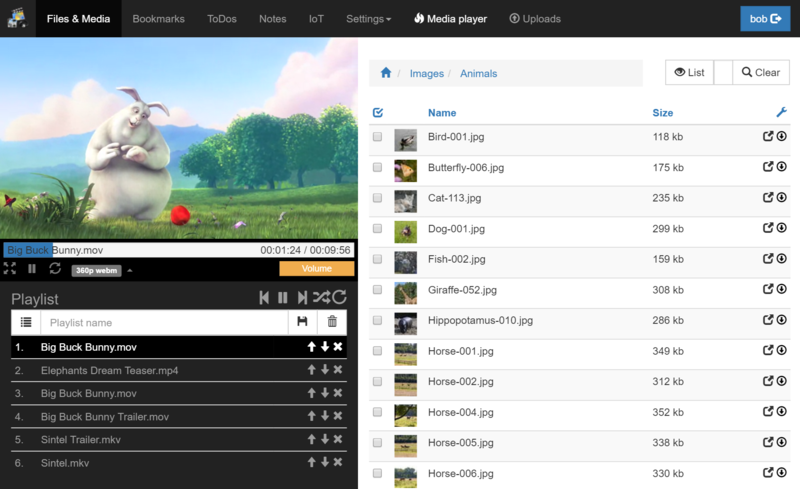 Feature: Configurable video download link with format, layout, audiotrack. Change: Replaced lots of small icon-buttons with context menus for a better touch. Other: Updated third party libraries. Release 2.6 - Let's encrypt! Features: ACME client for Let's encryt certificate management. Configurable via Web-GUI. Feature: Loader animation in fullscreen image gallery. Feature: Clean row design for ToDo's instead of wired floating design. Other: Updated build-in libraries: Spring 4.3.8, Hibernate 5.2.10, Jetty 9.4.3 and much more to be fast, secure and up-to-date. Fix: Fullscreen video scaling on monitores wider than 16:9. Fix: Performance and stability of filesystem scan and synchronization. Fix: File listings and paging after item delete. Features: Gallery thumbnail style is now configurable. Choose between small and large, cropped or not. Feature: Some style changes in gallery view as well visible file names when in thumbnail and fullscreen mode. Feature: Changed some forms for better usability and keyboard navigation. Feature: Embedded Google Noto Fonts for a unique look and feel within all browsers and operating systems with a maximum of supported languages and characters. Monospace for notes and logfile viewer. Feature: Better integration of selection actions instead of simple buttons. Feature: IoT control now can receive and pull sensor data too, just in case you want to keep the state up to date whenever devices are controlled from somewhere else. Feature: Improved external file links by adding filename, format and extension for nicer downloads. Other: Lots of technical improvements in build and automated testing. Fix: Label selection box in smartphone view. Fix: Packaging of Ffmpeg in Win32 release. Fix: Missing clipboard actions in gallery and music view. This time we tweaked some multimedia stuff. Ffmpeg and ImageMagick packages are up-to-date once again and we separated windows 32-bit and 64-bit releases for better performance, compatibility and format support, so be sure to use the release matching your CPU to avoid strange problems when it comes to multimedia processing. Moreover we changed algorithms for video standard detection and scaling and added support for some more codecs. Feature: Video format detection (720p, 1080p, ...) now less strict so that only one side needs to match exactly while the other could be smaller. This helps to kategorize formats like cinemascope the right way. 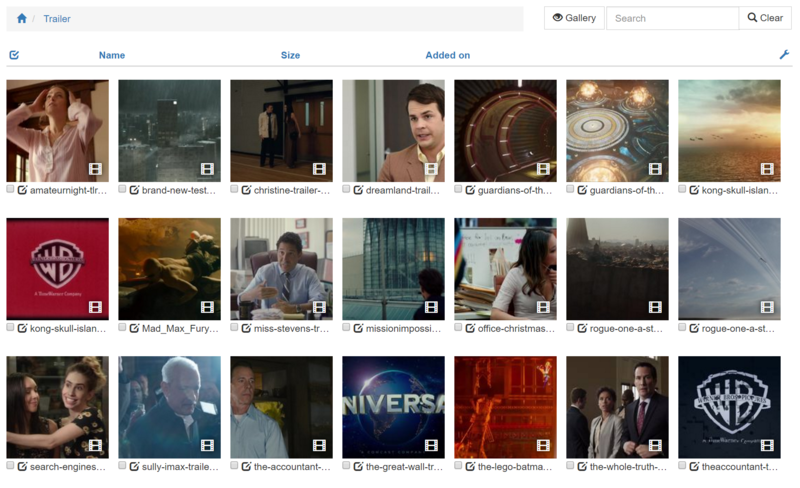 Feature: Thumbnails and preview images for audio covers and videos extracted from ID3Tags or video itself. Feature: MJPEG and better FLV video codec support, ALAC audio codec support. Feature: Added online help links to replace long inline descriptions and keep UI compact. Feature: Separate Windows 32bit and 64bit builds with corresponding ffmpeg and imagemagick packages. Please use the right release for your CPU architecture, since there've been some problems in tool execution with old windows32 releases on 64bit machines. Feature: Updated to windows ffmpeg 3.2, linux ffmpeg 3.2.2 and windows ImageMagick 7.0.3. Change: Merged four possible log configurations to keep things simple. Change: Video scaling mechanism to prevent stretched pixels produced before. Change: Some design improvements in list and gallery view. Fix: Linebreaks in videoplayer when title is too large. Fix: Too restrictive security checks in windows machines in dev mode. Fix: Added missing input length validation of name files for bookmarks, notes and todos. Note: With the new audio cover and video preview thumbnail feature we had to change some internal data structures. By default audio covers and video images are extracted only for new file uploads and scans. To extract images for all existing files we provide a job under "Settings/Files & Media" that we don't auto-execute on update because this might take a lot of time and we want you to choose when to run this task. 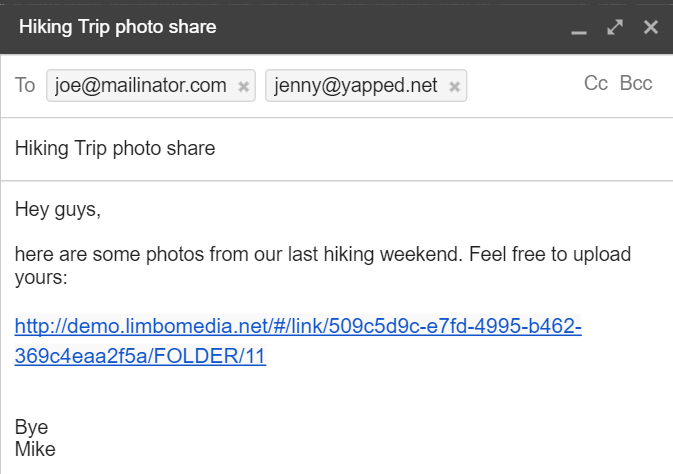 This release brings you the most frequently requested feature of all time: Link based folder sharing. Now you're able to share things with friends even if you don't want to create user accounts for each single one of them. You can choose between read-only or write access and send the link however you like (email, ...). As always, we tried to keep things fast and simple, so we decided to allow these kind of shares only on top level folders. This helps you to keep things under control and prevents an authorization mess like some of you might've seen in other cloud drive services. Feature: Share-Links for folders. Create links to share your folders with friends that don't have an account on your server. Read only or with write access. Improvement: Removed read-role, because every user has this role implicitly. Other: Updated third-party libraries (Spring, Hibernate, JAudiotagger). Other: Internal restructuring of security mechanism to improve performance and security. Fix: File and folder clipboard for copy & paste didnt work since we made folder URLs navigable. Fix: Mediaplayer didnt reset on user logout. Fix: Show error message instead of success message when uploading an invalid file for import. It has been quite some time since our last release but today we're proud to present the new 2.2 limbomedia release. This time we focused on 2 major topics: Better usability and the start of a new IoT feature lane. Better usability means that we decided to use the full screen instead of a centered layout and moved the media player to a sliding sidebar, so you could always keep an eye on your media playback while browsing other things. Since we ourselves really like all those maker culture things going on right now, we thought it'd be nice to create a new IoT feature lane to support all you makers, raspberry and arduino lovers out there. Our goals is to build a nice all-in-one homeserver solution, so we focused on home automation needs and added some first features to collect sensor data with graph visualization. Aditionally we added some basic controls to send basic commands and values to your devices via HTTP or UDP. We hope you enjoy! Feature: Start of a new IoT feature lane. 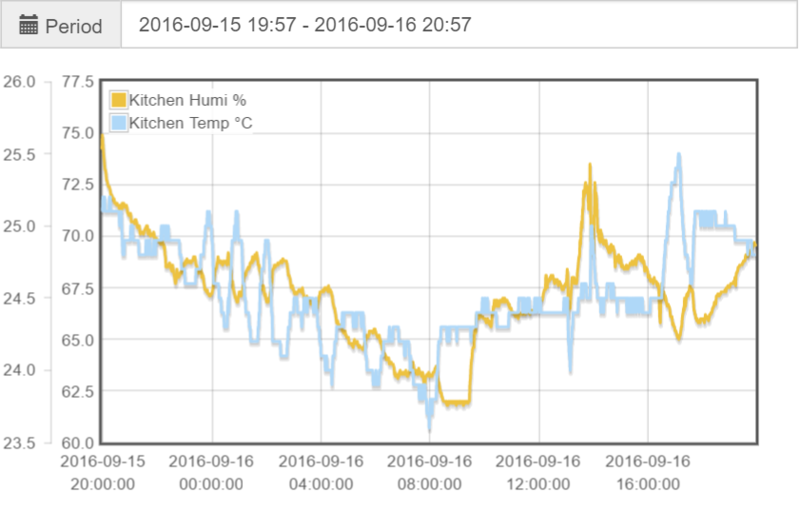 Feature: Sensors data collection and graph visualization. Feature: Basic controls to send commands to your selfmade IoT devices. Feature: Sidebar MediaPlayer enabling you to always keep an eye on your media playback while browsing and scrolling around. Design: Better responsiveness for smartphones and tables coming along with new full screen and sidebar media player. Design: Restructured ToDo view to catch all of your todos with one view. Design: Some small changes in note view. Design: Some restructuring in settings menu. Improved: Handling of video byte range requests. This should massively speed up seeking in videos when playing original formats via WebGUI or UPnP/DLNA, especially for large files. Other: Restructured HTTP/REST/JSON API for easier handling and upcoming features (ongoing). Other: Lots of internal restructoring for better structure, performance, stability and error handling. Feature: Simple BASH/Busybox web-integration for quick remote administration tasks on your server. Based on websocket technology. Feature: Gallery now showing non-image-files, too. Feature: Added link dialog showing file and media links to send to friends or open in external applications (video player). Feature: Clipboard for files and folders providing cut, paste, copy and move operations. Feature: Store and recover Http sessions on server stop/start. Feature: Cancellation of running filescan background jobs. Feature: Admin-statistics for all users. Feature: SSL(Https) configuration via well-known PEM formats in addition to complicated java keystore mechanism. Feature: Configure prefered video playback format via user setttings. Feature: Simple server GUI (logview + shutdown button) with systemtray support. Enabled in limbomedia.exe or via lm.gui=true. Change: Core Streaming-Pipeline refactoring for more performance and better error handling. Design: More compact table-style in filebrowser to get more stuff on one screen. Design: Small image thumbnails in filebrowser list-view. Design: Select labels with selectbox in small viewport. Fixed: Upload-Box gets stuck when filename contains illegal (non-latin1) characters. Fixed: Mediaplayer "repeat all" option. Other: Requires Java 8 (Oracle JRE as well as Open JRE). Other: Updated 3rd party libraries (Angular 1.4.5, Hibernate 5.0.1). Other: Improved security with CSRF protection and httpOnly session cookies. After a lot of work, today we're proud to release our new LimboMedia version 2.0. Complete new "File & Media Browser". We replaced the old audio, video, images and file sections with one great new file browser allowing you to browse all your files at once or in different views. Support for hierarchical subfolder structures and integrated filesystem synchronization. We know you like your file and folder structures, so now you've got them as they are in LimboMedia! Redesigned media player. Now with support for mixed audio and video playlists. Support for bleeding-edge media formats: HEVC (h.265), VP9, Opus, Wav. New overlay notification (via notify.js). View settings (visible columns, ...) now stored in browsers local storage instead of user profile to allow different settings on different devices (pc vs. smartphone).